And the vodka hits just keep on rolling. 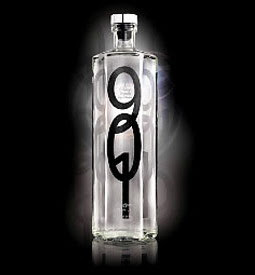 DQ Vodka's gimmick is that it's the "Nuclear Vodka" as the shape of the bottle resembles plutonium rods. The unique bottle also has some functional purpose, as it is poured, the vodka is drawn through a central shaft, enabling oxygen to get into the liquid and allowing it to breathe. The wheat vodka uses water from a highly-protected, glacial source and is then distilled through multiple columns. The interesting thing about DQ is that they start out with a fermented product that is already 9% alcohol. Though I have no idea how this would change the flavor if you're going to end up distilling it to 90% alcohol anyway, I'm open to the concept. I'm very open-minded when it comes to booze. Before the whole thing is finished they add a bit of a "richer" product to the final batch, though there's no info on what that richer product is. This bottle of Jim Beam's Red Stag Black Cherry Bourbon has been sitting around the house for a few weeks. Matt Lauer's recent accident on his bike with a deer prompted me to drag it out and see how it went down. The bottle looks like the standard Jim Beam type bottle but with a pair of deer antlers on it. I imagine the first concept was to have the full deer on it but the rednecks in test groups wanted to shoot at it, so they removed the rest of the deer. I'm a pretty big bourbon lover which means I was pretty ready to take a sip and then pour it down the drain. I tried my first taste and felt a bit of the burn but was then pretty pleased with the cherry notes that weren't too heavy. However, my first few tastes felt a bit syrupy but I got used to it fairly quickly. A few sips later I was thoroughly enjoying it and ready for another glass. Justin Timberlake could take a poop in a piece of tinfoil, roll it up, attach a couple of fish hooks to it, then sell it for $10,000 as earrings. That JT, he's so hot right now. He's now going to use his hotness to pimp tequila which is, if you think about it, the perfect pairing. The tequila is sourced out of Jalisco, Mexico and is expecting to launch in LA, Las Vegas, St. Louis (??? ), and New York sometime this spring. Why 901? A spokesperson for Timberlake explains that "901 is that time of night when your evening is ending, but your night is just beginning." I don't think that's really the case, because 9:01 is about the time American Idol comes on. 901 is also the area code of JT's hometown of Memphis. The link to the site must be a placeholder and is currently being used by the same people who are going to make the 901 Tequila. But, for now, you get a big phallic bottle of tequila in its stead. Trying to sell vodka isn't always easy. You have to go through things like "State Approvals" and "Liquor Boards" and "FDA Requirements That Make Sure You Don't Kill Anyone." Bullocks to that. Silver Mustang Vodka is cutting the red tape and sending their vodka directly to you, just like the Shamwow! However, there's still some red tape that the government has to get involved in so they only ship right now to California and Nevada. Mustang vodka says that their vodka embodies "the living symbol of America's free spirit" and is, of course, made in Poland. Which seems about right. This stuff is only available online and it comes in a plain box, just like the toys from those other places you order, so your neighbors won't think that you're a complete lush. The bottles come in a gift pack of 3 and, right now, that's the only thing you can order, but why would you want to order just one anyway? - I'm surprised that bar week was last week in Vegas and that the most that came out of it were a few press releases that Blue Ice was going to do an organic spirit. - I drank with Jeffrey Morgenthaler in Portland and lo, it was good. His new menu at Clyde Common sounds fantastic (as is the current one) and we even got to try a few things out at another bar that blew my mind. The difference between cocktail cultures in Portland and San Francisco? The Portland bartenders are still friendly and don't treat you like you're cutting in to their "cocktail creation" time when you ask about the drink. A mini-bottle gets yet another mini-review. 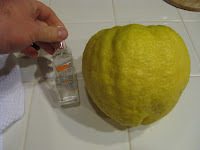 Here's the bottle next to a lemon from my lemon tree. Granted, I grow HUGE lemons.